Chef Rino Bortolin has been in the hospitality industry for 22 years. 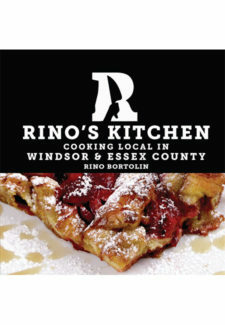 He has cooked at Il Gabbiano, Nico Ristorante, Porcino, and Spring Wine Bar; he has also owned and managed three Windsor-area restaurants (Vivo! Ristorante, 2000-2005, The Black Kettle Bistro, 2008-2010, and Rino’s Kitchen, 2010-present). His restaurants have been praised as Best New Restaurant (BizX), Best Wait Staff (Room), and have won the Hospitality Hero Award. This is his first cookbook.